With Halloween just days away, Facebook is adding several features inspired by the year’s “scariest” holiday. Among others, a game on Facebook Camera. Halloween is coming, and Facebook wants you to know. This week, both Facebook and Messenger platforms will be a hotbed of Halloween-related activity and lots of fun and games. Even if you don’t want to get dressed up this year – it’s too much effort, or “I’m too old for this” – you can still use several features coming to the platforms. Among them, AR Halloween costumes, and the first-ever game within Facebook Camera. You will most probably get a notification on your News Feed this week, wishing you “Happy Halloween,” but that’s not all. The message will lead you over to Facebook Camera to try on a mask and add a frame. Dress up as a goblin or a cat, without “dressing up.” And there’s more. Broadcast live with Facebook Live and you’ll see a set of masks and effects you can use there as well. The masks and other goodies are standard fare, but Facebook has also built the first game within Facebook Camera as well. The game features your face (added to the character of the game) and you have to escape a haunted house by jumping around. Your face changes expression as you play the game… it’s… scary. 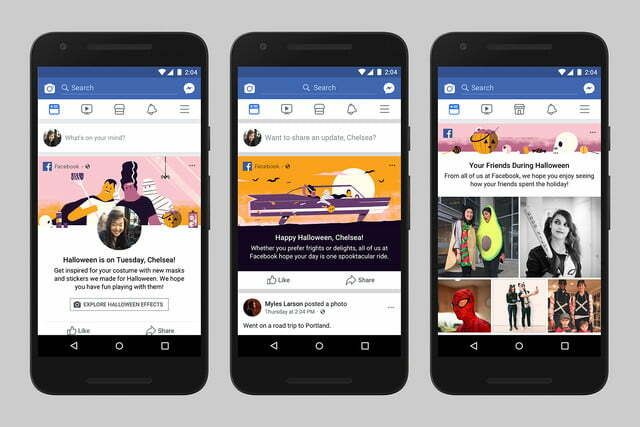 Finally, Facebook brings themed backgrounds for your status updates as well, and suggestions for nearby trick-or-treating events. There are actually over 500,000 of those planned. Halloween celebration continues with new themed backgrounds for status updates. Facebook will also suggest nearby trick-or-treating events, with over 500,000 events already planned. Halloween was one of the most active and engaging holidays for sharing on Facebook last year, so the platform is prepared this year. Just wait until the end of the week for the fun to begin. Facebook celebrates Halloween… with lots of goodies – including the first Facebook Camera game.